Immunohistochemistry is a highly sensitive method that allows the localization of antigen within a cell or a tissue with high resolution. The method is based on the use of a primary antibody that specifically binds to its complementary antigen. The bound antibody may then be visualized by a variety of methods such as colorimetric end points. 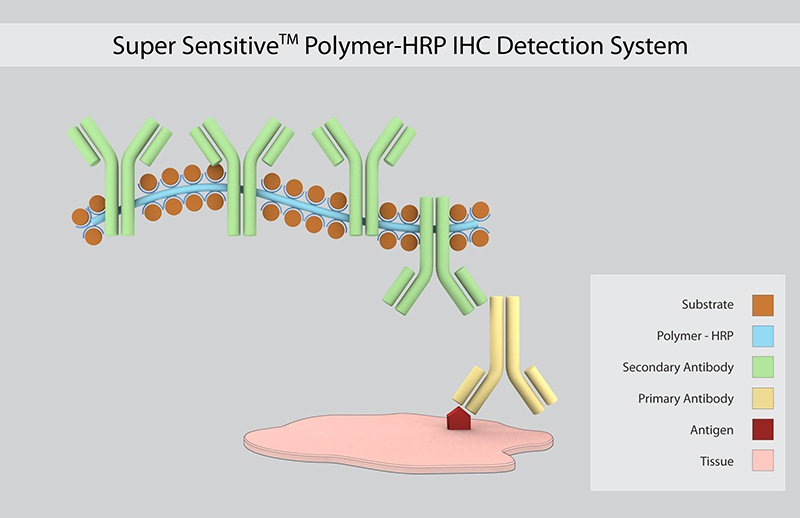 This is a novel detection system using a non-biotin polymeric technology that makes use of two major components: Super Enhancer and a Poly-HRP reagent. As the system is not based on the biotin-avidin system, problems associated with endogenous biotin are completely eliminated. The enzyme horseradish peroxidase (HRP) catalyzes the conversion of chromogenic substrates (e.g. DAB, AEC) into colored products facilitating tissue staining. Available in RFID tagged (Xmatrx) or barcode labeled (i6000) vials for automation or in drop bottles for easy to use manual staining. Cells or tissues are prepared and incubated with an unlabeled primary antibody that will bind to the antigen. 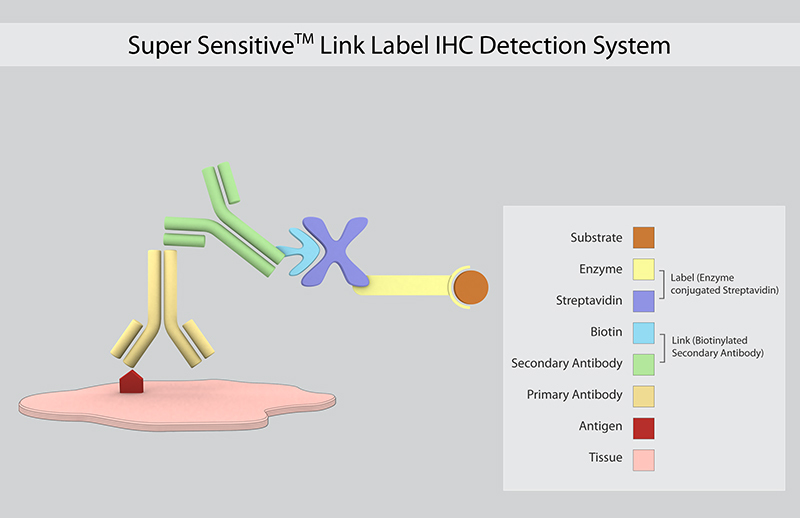 The bound antibody is detected with a LINK (species-specific secondary antibody conjugated to biotin). The bound secondary antibody is then allowed to react with Streptavidin conjugated with an enzyme (Label). Streptavidin binds extremely strongly and irreversibly to the biotin residues on the secondary antibody resulting in the addition of multiple enzyme to the primary antibody complex. A substrate is then added and acted upon by the enzyme producing a highly visible precipitate. DAB or AEC substrates are available for HRP Labels while Fast Red, Elegance Red and New Fuchsin substrates are available for AP conjugated labels. SKU Size Polymer-HRP DAB buffer DAB Chromogen Peroxide block Power block Hematox. EZ-AR Eleg. 1,2 & 3 Sol.